No, this is not an attack on the political system, just a quick posting to let readers know about an interesting website covering the lesser known facts about Croatia's snake population. We've some friends on Čiovo Island, with a lovely garden, who occasionally find their dogs barking at the odd reptile and this site will help them, and those like them, identify the extent of the threat, if any. The link is http://www.zh.zadweb.biz.hr/ and you'll find a complete index and details on every species and sub species that can be found in Croatia. The snake in the picture (copyright Mladen Zadravec) is one of the most venemous in Europe - the Nose - horned viper. It pays to stay well clear of this one but most of the snakes that you'll come across are harmless. The site writer, Mladen Zadravec is obviously a snake lover and makes the very important point that all Croatian snakes are protected by law and it is not permitted to disturb or remove them from their habitat. Remember that they're normally more afraid of you than the other way round and will move away if they can. Many of Croatia's snakes are endangered and there is a page on the site explaining why and what might be done. Visitors shouldn't worry too much - Croatia is more rural than England, so if you're a townie the chances of spotting one here are higher than at home, especially away from the coast. However you're unlikely to come across one, and if you do, as Mladen says, "just leave it to go about it's business in peace". In the unlikely event that someone gets bitten by one of the few vemomous snakes around, try and identify the snake (or take a photo) and go straight to the hospital. 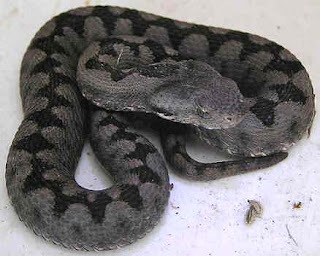 Mladen tells us that the Nose - horned Viper seldom bites, and if it does, it's rarely fatal. Given that it's also a rare snake, the chances of an encounter are extremely remote. a) human beings are more of a threat to the snake population than the other way round. Snakes will defend themselves but will not attack unless provoked. This is a great specialist website and we wish Mladen all the best in his efforts to assist people to become more educated about Croatia's snake population and what needs to be done to protect it and let it live in harmony with its human neighbours. Thanks to Mirko Beović for today's amazing photo. See below for more details. In Croatia Online's short life, it's great to be able to celebrate 20,000 hits, well before its second anniversary. We marked our first birthday, and our first 10,000 hits, in January 2007 so, if that’s a reflection on the interest in Croatia then it’s nearly 50% up compared with the previous year! Rosie, our dog, had her first ever haircut to try and help her through the heatwave. Our friends help to maintain the diverse content of Croatia Online. It may be a little bit “overworked” in the height of the tourist season, but if you can brave the crowds, or better still visit in September, you won’t be disappointed. A short cut to some of the postings on a few of our favourite destinations. This posting also has direct links to some of our key business reports and includes one of our favourite photos. Yes, Croatian is hard for us English speakers, but maybe an immersion course is the best way to tackle it and enjoy the best of Istria and Croatian cuisine at the same time. And just for a bit of nostalgia, click on the direct link above to see how we celebrated our first 10,000 hits. There’s been much more – Vis Island revisited, drinks on board HMS Cornwall prior to her much reported visit to Iraq, the Split Boat Show, a Mandolin concert, the delights of Dugi Rat, inland Croatia, Croatia for families, Time Out, travel news, etc, etc. There’s a lot more to come and, now that one of our major projects has been nearly put to bed (news imminent), we should have plenty of time to unearth Croatia, online, in even greater depth. It’s been hard to choose a photo for today’s news but a Croatian friend pointed us in the direction of a truly spectacular photo which relates to our immediately preceding posting. Only a true “local” could know where to stop along the mountain road to see this view and the statue safely (which we did last Friday). Only a passionate professional photographer could have captured this scene. Even better there’s an intensely rich history around the statue, the Pirates of Omiš, and the marauding Turks that were apparently foiled, single handedly, by the charms, wiles and patriotism of the lady honoured by the sculptor. 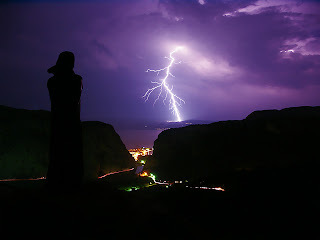 The photo is the copyright of Mirko Beović and you can see more of his stunning images on http://www.mirkobeovic.com/.